We had a house fire in February, Bob and his crew showed up and boarded up the house right away. The next day he was back with his crew and removed all our belongings that were able to be saved and cleaned every piece and stored them for 6 months. Today ,6 months later they returned every thing to us and I was amazed how well it all looked! No smell of smoke on anything and the girls had everything packed so well! I really cant thank each one of them enough! Bob Timmel is the man to call, he really knows what to do when a disaster happens! Last year I had a pipe burst in my upstairs bathroom while I was away on business. When I got home my entire house was flooded. Disaster Relief showed up shortly after I called them and immediately began the process of cleaning up all the standing water. Once everything was cleaned up they had my house repaired in no time and it looked as if nothing had ever even happened. They handled everything with my insurance company and I didn’t pay a dime out of pocket. 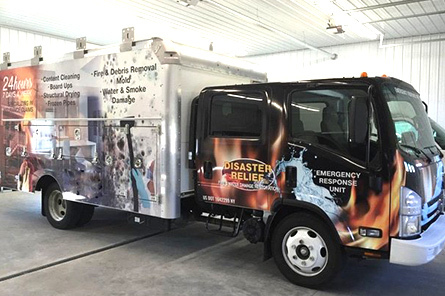 I would recommended Disaster Relief to anyone who is in need of water damage restoration or any disaster restoration at all including fire. In my opinion there is no better water damage restoration company in the Buffalo NY area. These guys are awesome and did an amazing job!